Surefeed E2 Varies Buy Now! A rifle magazine is really simply a metal or polymer box with a spring, baseplate, and follower inside of it. Simple enough. You can 3D-printone even. However, to avoid a dreaded malfunction, everything has to work together, flawlessly. The spring must be at a specific tension in order to advance the round properly, the follower cannot be too rough, and the magazine itself needs to be robust and reliable, especially with the hard use professional and a lot of citizen users subject them to. Okay Industries co-developed the 30-round aluminum AR15/M16 magazine in the late 60s/early 70s. Prior to this, the black rifle usually was issued or shipped with 20 round magazines, which was found to be insufficent for most situations, especially considering the smaller 5.56mm round. So, 30 rounds was declared the standard, and Okay stepped up to the plate, as they had produced quality magazines for a variety of firearms prior to that, including the venerable M1 carbine, under their original name of B Jahn. Rapidly, the Okay name became sought-after by soldiers who “knew their stuff”. Many military contractors produced 30-round magazines, but Okay magazines were regarded as the best. The citizen shooting world took notice, and surplus Okay magazines were prized and commanded a decent markup on the secondary market. After many decades, Okay finally released their magazine to the general public. These were identical to the original USGI magazines by Okay, and were sought out by “clone” builders (people who look to produce a rifle that is a replica of a certain military rifle, i.e. a Vietnam-era M16), with the new E2 variant being the latest evolution of the Okay Industries Surefeed magazine. Polymer is all the rage, so why aluminum? Chances are, your AR-pattern rifle shipped with a polymer mag, most likely the ubiquitous PMAG by Magpul. They’re cheap, reliable, and Magpul turns them out by the planeload. Nothing wrong with that. Polymer is seen as the evolution beyond aluminum, even. However, aluminum and metal magazines still have their place. For one, they are proven. Since the inception of the AR platform, aluminum magazines have been the “standard”. 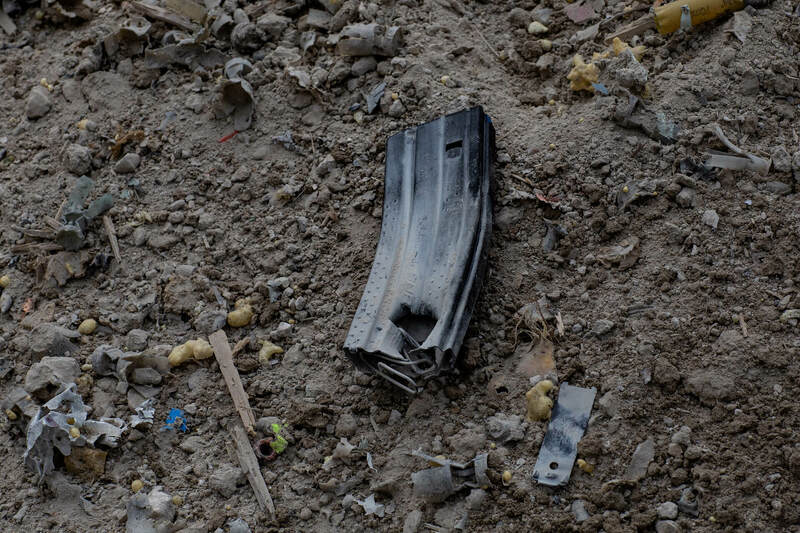 While it can be argued that aluminum magazines are not as durable as new polymer magazines, your standard USGI mags have decades of combat proof that say otherwise. There’s a back-and-forth argument that aluminum holds up better in extreme cold, but Magpul does dispute the claim. However, it is a definite fact that aluminum magazines are usually cheaper than their plastic fantastic brethren. Also, as I noted in an eariler test of the Daniel Defense DD Mag, aluminum magazines fit older AR/M16 rifles better. So what makes the Surefeed E2 Magazine special? 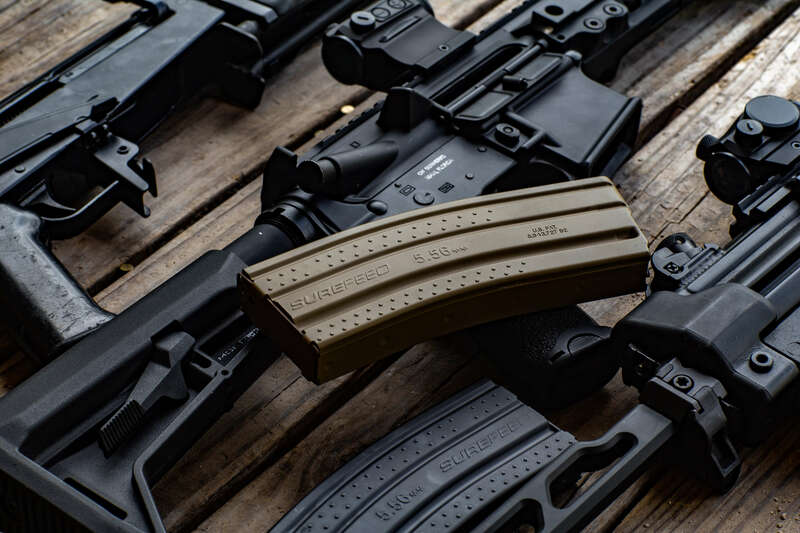 At first glance, the Surefeed E2 5.56mm AR magazine looks like any other aluminum AR magazine made over the past 40 years. Multiple vertical ribs, and a slight curvature. But that’s where the similarities end. Like any interchangeable part on an AR, the true differences are internal. The E2 magazine features textured side panels for a positive secure grip during mag swaps. It also has an enhanced feed lip design that reduces friction and improves cartridge alignment for reliable feeding. The spring is tensioned just right, for optimal function in semi-automatic and full-auto firing modes. The four-way anti-tilt follower enhances reliable feeding for less chance of a jam. Each magazine is coated with a Teflon-like substance that resists corrosion and even keeps the mags looking fresh after hard use. That’s nice, but what about in the real world? Much like my last magazine review, the opportunity to review the Surefeed E2 magazine came about at random, as my friends at The Mag Shack offered to ship me down a few to evaluate. The Mag Shack, out of Tallahassee, caters extensively to all types of shooters, from professional door kickers, to people like myself. It’s great to have cool gun businesses here in Florida. This time around though, I upped the ante for the testing a bit and called on Carlos & Willie, proprietors of CW Gunwerksto meet up down at Henry’s Range in the wilds of southern Dade County. It’s a no-frills outdoor range and everyone pretty much polices themselves. It’s great. Anyway, in addition to carrying a small selection of standard firearms and accessories, CW builds select-fire samples based on the AK and AR platforms, in addition to some fun curiosities like select-fire GLOCK pistols and the like. Fun. And what better torture test for a rifle magazine than using it to feed a rifle that is configured as it was meant to be, in full auto? So, on down to Henry’s. I arrived prior to the CW gang, and I decided to warm up by testing the magazine on a new pistol build that I had finished ages ago, but hadn’t gotten around to running. While (obviously) my pistol AR wasn’t fully automatic, I did have a CMC flat trigger installed, which I can get going pretty fast. Loading the magazine was simple and efficient - nothing unusual there. The magazine fit just fine - it’s standard, afterall. I had the range to myself (it was early on a Sunday), but regardless I called “going hot!”, and put 30 rounds semi-automatically down range. Flawless. After some minor adjustments to my pistol’s Poortex optic, I did another 30 just because. No issues. After about an hour, the CW crew rolled up with their motley crew of machine guns. Now for the real fun. After some catching up and basic education on just what makes a full-auto piece go, we got down to business. Since the purpose of this exercise was to stress-test the magazine, we didn’t fuss over accuracy - so basically we just did mag dump after mag dump using the Surefeed E2 magazines. After about 300 rounds continuous - no flaws. No failures to feed, nothing. Solid. The Surefeed is “Okay”! Of course, this was with us just “babying” the magazines. Load, make ready, mag dump, reload. The real torture is accomplished with rough handling. So, I tossed the mags against some rocks, dropped them, and otherwise subjected them to rough handling. Loaded, made ready. Again, flawless, even in full-auto. Now, for some added stress, we decided to up the ante a bit. Carlos, inspired by @klayco47 on Instagram, suggested we actually set the Surefeed E2 magazine itself up as a target, and shoot it. Then load it up as much as possible, and run it. So yeah - we actually shot a round through the magazine itself. Hey, it could happen in the real world. Bullets have struck bullets in flight, even. The magazine was pretty damaged after shooting it. The floorplate was gone, and the spring was partially dangling out the bottom. We still decided to load up some rounds and give it a test. Damaged, the Surefeed E2 still held about 15 rounds. So we loaded it up (something fell out! ), made ready, and did another mag dump. Even damaged, the Surefeed E2 held itself together enough to flawlessly feed 15 rounds into CW’s custom post-sample full-auto AR-pattern rifle. Impressive. In an emergency, those 15 rounds might be the rounds that save your life. Our little take on real-world battle testing. Definitely adding this one to the protocol - thank you Klayco and CW! With magazines, my general advice is to buy them cheap and stack them deep. You can never have enough. I like to spread out my choices between select manufacturers for variety and safety. With a critical component, you should never have just one vendor. I’m thrilled to add Okay Industries/Surefeed to that list. The evidence does stand as to why the pros have trusted them for over four decades. Again a special thanks to The Mag Shack for hooking it up, Surefeed for the awesome product, and CW for the full-auto fun.